Inspired and redesigned from the ground up - just as amazing in 5e! The 5e-version of the massive Creature Components tome clocks in at 60 pages, 1 page front cover, 1 page inside of front cover, 1 page editorial, 3 pages of ToC, 1 page advertisement, 1 page SRD, 1 page back cover, leaving us with 51 pages of content, so let’s take a look! This review was requested as a prioritized review and has been moved up in my reviewing queue accordingly. 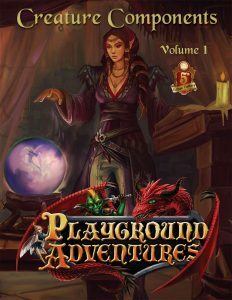 There is a further disclaimer to note here: While Playground Adventures generally focuses on child-friendly supplements, this one is aimed at a slightly more mature audience. The idea of this book is to use parts of vanquished creatures for magic, taking a cue from pretty much all real life mystical traditions and those depicted in fiction. While e.g. spell components already feature this theme, I figured it’d be worth mentioning. If young ones are really young and/or super-sensitive, this may not be for them. That being said, this is, as far as I’m concerned, really harmless. If you’re like me and have grown up in the country, of if you’re raising your family there, you should have no issues. The first thing you’ll notice upon opening this book, is that it is GORGEOUS. I mean it. With runes on the border and an elegant full-color presentation, the tome looks amazing. Furthermore, the books’ aesthetics are wholly in service to the conceit this presents: Basically, we begin with an in-character framing narrative, and then move on through the tome, with copious amounts of artworks in pencil-drawn style, lavishly-created by Jocelyn Sarvida, generating a sense of holistic integrity, and illusion of flipping through the pages of a xenobiololgist’s field journal. In-character parchment addendums add to this visually concise presentation. I love this. Now, as noted before, the basic idea of these components is tied to the innovation of power components: Basically, we’re talking about optional spell components that can alter the ways in which spells behave, harvested from defeated creatures. This simple idea is amazing, and frankly makes sense on so many levels. It is a nice reason to start adventuring; it allows the GM to reward the PCs for defeating certain foes, and it makes magic feel…well, more magical. I’m a huge fan of the concept. The harvesting process is btw. as simple as we want from 5e: You basically check Intelligence (Arcana) or (Religion), determining what parts of a creature can be used, with the DC ranging from 15 to 30. While this base DC is relatively high for a bottom DC, it makes sense – not everyone should be able to harvest these components, and it should not be too reliable. The DCs are btw. based on creature frequency – the rarer in a setting the creatures are, the harder harvesting gets, as a baseline. It makes sense: Knowledge and exposure on how to deal with a hunter/gatherer-resource generate a more broadly-spread knowledge regarding how to prepare the materials. I mean, many folks can prepare fish, but fugu? Beyond difficulty, it’s a rare craft there – I’d have no idea on how to prepare that properly. The harvesting process employs the Survival and Medicine skills, and similarly ranges in skill DCs ranging from DC 15 to higher; a harvesting attempt takes 1d6 x 10 minutes, and the check may be retried on a failure, but only if it wasn’t botched by 5 or more. The character gains a single component on a success, with another component gained for every 5 points by which he exceeds the DC. It is important to note that the pdf explicitly states that anatomical limitations cap this – a creature with two eyes can’t yield three doses from eyes, for example. On the other hand, some components can definitely yield more uses: Powdered claws, for example. A general guideline of challenge, ability DC and suggested market value is presented, and the book also provides precisely-codified rules for attempting to, at the GM’s discretion harvest components sans killing a creature. While nominally, even a successful attempt deals necrotic damage, this damage can by no means be mitigated, which is important regarding undead. Furthermore, the damage this inflicted reduces maximum hit points, not unlike a vampire’s blood drain, representing the significant potential damage. While this can be regained by a long rest, organs removed are gone and remain so. Now, if this aspect strikes you as a bit problematic, fret not, for the book explicitly denotes this as optional. The idea here is, for example, to allow a noble unicorn to sacrifice her horn to save a king, for a stalwart griffon to help the rider – you get the idea. (That aside, if you’re playing in a mature group, you can play this up as gory as you’d like – the presentation here is very much PG 13, but the content and mechanics here can easily be tweaked to account for a variety of tastes.) Similarly, thematic appropriateness of the use of a component remains, as a whole, firmly where it belongs, in the hands of the GM, and the pdf provides a rather helpful section that provides guidance when implementing this system. But what about e.g. ghosts and air elementals of different beings that lack a physical body? Well, the pdf introduces the essence vial, an uncommon magic item that allows the character to collect the essences of such beings. The pdf smartly discusses the consequences of introducing these components regarding gold value and risk and reward. Particularly in 5e, with pretty low spell-durations, it should come as no surprise that harvesting, due to its duration, can be a pretty strenuous activity regarding PC resources. Still, for GMs favoring grittier games, the pdf alternatively suggests subtracting the value of these from the rewards otherwise granted. Since 5e is less contingent on WBL-assumptions than PFRPG, this should generally not yield issues, and the solutions suggested are solid. Now, how does the enhancing of spells work? Well, only a single creature component can be used in conjunction with a given spell; however, and this is very important, maintaining such a spell becomes tougher due to the magic unleashed from the components. Constitution saving throws made to maintain the spell are increased by 5. Additionally, the pdf does not just provide means for the GM to use the components herein; instead, we get concise guidelines to determine effects for creature components, as they’re grouped in three categories: Lesser, moderate and greater. These categories are assigned effects, some of which are rather intriguing, for example featuring the extension of a spell’s effects for 1 round after concentration ceases. Limited damage type changes, slightly increased spell save DCs – the modifications to the spell-chassis are solid and take the peculiarities of 5e’s spellcasting engine into account. Nice: The supplement also discusses potential downsides for particularly potent components. Such creature components, obviously, also make sense for use in conjunction with magic items, with a table by rarity denoting DCs; the book also discusses the use of such components in conjunction with item creation for non-charge-based and permanent items, providing a brief array of rules for formula research – considering 5e’s barebones means for item creation, I enjoyed this brief section, even though it remains, by design, rather basic. Cost reduction in such a context is also noted, just fyi. It should also be noted that the pdf similarly codifies the means to make magic permanent, though, once more, the means to do so remain in line with the rather easy to grasp 5e-mechanics. Now, I’ve delayed this long enough, so how do these components work? A component is presented with an easy to read statblock of sorts: The entries list the most commonly-used components, and some creatures may yield multiple, different components. The entries also list their potency (lesser, moderate, greater) and then proceeds to note the spells that can be affected. Important: When a spell can be enhanced, so can its derivatives: If you can, for example, enhance restoration, then you can also use it to enhance greater restoration. Beyond those aspects, we have costs and descriptions noted. It should also be noted that sub-species are taken into account: You can, for example, harvest devil’s blood from all types of devils, but obviously, you can only harvest barbed devil barbs from, well, a barbed devil. Speaking of which: These illustrate rather well the power and coolness of these options: Said barbs can be used to enhance any spell that enhances AC, and when used thus, creatures within 5 ft. of the caster successfully hitting with a melee or spell attack take 1d8 piercing damage per 2 spell levels above 1st. Vrock spores enhance spells that inflict the poisoned condition and add minor poison damage to the effect…and before you think about abuse, even if the poisoned condition does not allow for a save to end it, the ongoing poison damage bestowed by the component does explicitly allow for a save to end it. Cool: Dragon turtle glands transform fire-damage causing effects into steam, making the spells functional underwater, and mitigating resistance gained due to immersion in water, but ONLY this resistance. Adding a gibbering mouther’s saliva to an acid-based spell can make it blind foes on a failed save…and here, just fyi, a default save for save-less effects is noted. The potency of components also hinges on the power of the spell they supplement, which is a clever trick: Gorgon horns, for example, partially can calcify victims of spells resisted with a Dexterity save. While nominally, this effect causes necrotic damage, it scales with spell potency, and when used in conjunction with 7th level and higher spells, it can petrify targets! It should also be noted, that, while classified as necrotic, the special damage inflicted does affected undead and instead is ignored by beings immune to petrification. Also interesting: The damage thus inflicted does only heal by magical means. A Hippogriff’s feathers can increase the speed of a fly spell to 80 ft., highlighting another component I very much enjoyed here: Instead of competing/superseding the enhancements available via 5e’s spellcasting options at higher levels, the pdf instead focuses on alternate augmentations, adding another level of resource-bound flexibility to the spellcasting engine. I mean, come on, how cool is it to have your sorcerer draw forth that lycanthrope’s blood, powering enhance ability…but also risking lycanthropy? Wait, what? Yeah, not all of the components herein are safe to use: PCs that don’t exert the right amount of care may, for example, find themselves with a dangerous addiction to nalfeshnee vertebral fluid. (Ew!) Harsh? Maybe. But, you know, using a greater demon’s brain juice? Yeah, that SHOULD carry a risk! Depending on creature scarcity, there are some rather potent tricks here: When using, for example, an oni’s horn in conjunction with alter self, you also get a whopping +4 to Strength and Constitution and a size-increase to Large! Adding a stirge proboscis to a spell imposes a penalty on death saving throws when reduced by one to 0 hit points. Nice, btw. : The book takes care to account for some of the more subtle distinctions of 5e: While in PFRPG, a succubus is a demon, 5e assumes them to be their own type of fiend, and as such, the listing of the creature component also mirrors this decision in 5e – this is relevant due to the general components like demon’s blood, which can, correctly, I might add, not be harvested from succubi. I should also mention that specific components have different effects: Skeleton dust can, for example, be used to enhance animate dead…or it can be laced into a magic circle versus the undead. The book covers a ton of well-crafted components, though it should be noted that closed IP-creatures could not be tackled. This is no fault of the supplement, but the consequence of how IP works. Beyond the massive array of components, we have 6 new feats. 4 of these represent having angel, demon, infernal or dragon blood in your veins, enhancing an ability score, helping harvesting, and the options to safely harvest certain types of blood. Beyond these 4, we have Component Caster, which increases a mental ability score of your choice by 1 and eliminates the concentration DC-increase for incorporating components. Component Crafter enhances harvesting and, surprise, crafting. All of these feats, power-wise, are in line with 5e’s aesthetics. The final section of the pdf provides 12 magic items: 2 of these would be improved variants of the aforementioned essence vial, and elixirs that help control specific creatures can also be found. There is a very rare cloak made from blue dragon hide and the means to create a legendary remorhaz forge! A quill that seals objects with a riddle, a super aerodynamic manticore spike dagger, a powerful armor made of the wrappings of a vanquished mummy lord –pretty damn cool selection here! The pdf closes with 4 variant magic items and ends with a nice piece of in-character prose. Editing and formatting are top-notch on a rules-language level and a formal level. Layout is absolutely gorgeous and adheres, as noted, to a beautiful two-column full-color standard. The artworks, similarly, are mind-blowing, with one single exception: A chapter-introduction artwork depicts, oddly, a solid CGI-type artwork that deviates in style from the others and sticks out like a sore thumb; that being said, the only reason I mentioned this, is that the pdf otherwise adheres to a uniform and tremendously beautiful style. The pdf comes with detailed, nested bookmarks that render navigation of the file comfortable and smooth, sporting bookmarks for the individual creatures. Now, if you’ve been following my reviews for a while, you’ll have noticed that I loved the original PFRPG-version of Creature Components Vol. 1 – it is a phenomenal book, and made my Top Ten of its release-year in 2016. It should come as no surprise, then, that I did somewhat dread this conversion. The systems are different in many key components, and I really hoped that Daniel Marshall’s inspired book would properly survive the transition to 5e. It is my utmost pleasure to note that the 5e-version does not lose the magic and inspired aspects of the original. Indeed, supporting authors/devs Dan Dillon and Stephen Rowe, two authors that are often synonymous with being fantastic authors, have done an excellent job here. To the point where I’d hesitate calling this a conversion – this is a redesign from the ground up, made lovingly to account for 5e’s needs. All imperfections I found ultimately boil down to be truly minor and can’t, in any way, compromise how awesome this supplement is. Creature Components render magic more magical; they add to the immersion into the fantastic world. Beyond adding tactical depth and a rewarding component to resource management, beyond making previous victories of the PCs matter more, the book succeeds in improving further differentiating the impact of the creatures themselves on a fantasy setting. While, having already qualified in one of its previous iterations as a Top Ten candidate, this supplement is thus disqualified from qualifying again, I consider this to be a truly excellent and highly recommended supplement for your 5e-games, and as such, my final verdict will clock in at 5 stars + seal of approval. This should be considered to be on par with a Top Ten-winner, and a must-own offering for 5e, earning this my EZG Essentials-tag, a must have, inspiring, game-enhancing supplement. You can get this inspired book here on OBS!